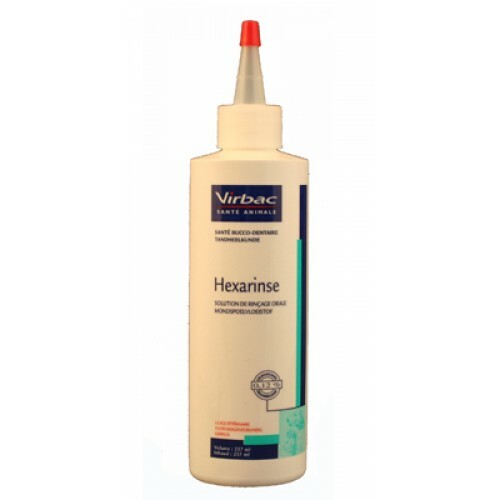 Virbac Hexarinse is a refreshing and pleasant tasting rinsing solution containing chlorhexidine gluconate. The anti - microbial activity of chlorhexidine helps prevent tooth and gum disease. Chlorhexidine inhibits the formation of bacterial plaque (plaque). Hexarinse is a soothing, refreshing and palatable rinse containing chlorhexidine which aids in the prevention of gum and tooth disease. It will leave your pet with fresh breath while providing temporary relief of gum irritations. Dosage rinse daily following each meal.